Change, sudden shift, upheaval, release, revelation, divine intervention, liberation. Chameleon is the shaman of adaptation. Seizing the power of cloaking, he changes colour to blend with his shifting surroundings. Life is change, and you have the choice to either accept change, or to resist it. By clinging to ideas that no longer work within the structure of your spiritual evolution, the winds of revelation will force you to go with the flow. Chameleon is here to help you shift the colours of your state of being, setting you on the path to your highest truths. Relax, place trust in yourself, and release fear. By attuning yourself to the magic of Chameleon, you become more perceptive and accepting to the powers that surround you, and to the powers within. 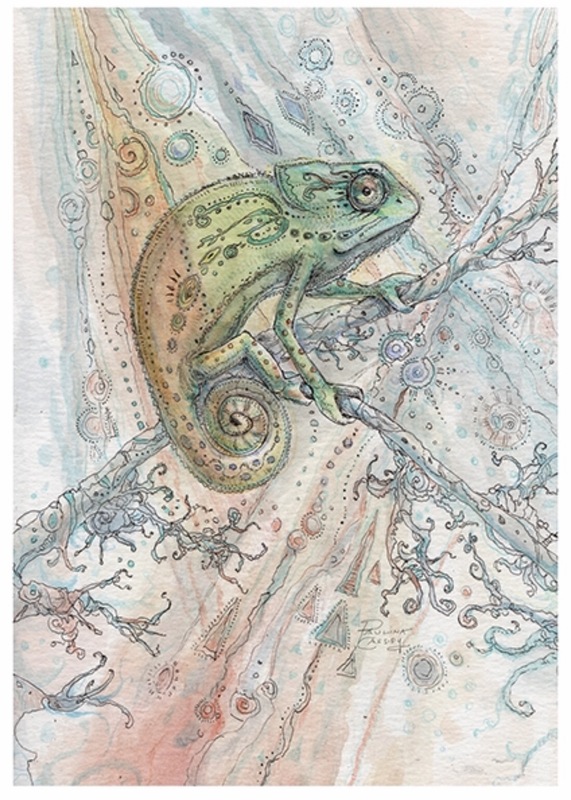 This entry was posted in Artist, Deck Review, Featured Card of the Day, General Tarot, Readings and tagged Chameleon, Paulina Cassidy, Spiritsong, Tarot, Tower.